The industry standard set of headphones, the Audio Technica ATH-M50XRD's are now available in this epic limited edition red! 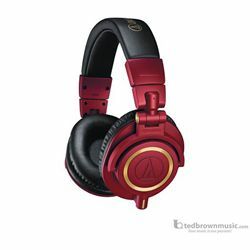 Get the most comofrtable set of headphones and the most honest sound to your mix, perfect for studio or DJ work now with the Audio Technica ATH-M50xRD Red Limted Edition Headphones! From the 45 mm large aperture drivers to its sound isolating earcups and robust construction, the ATH-M50xRD provides an unmatched experience for the most critical audio applications, including recording, live sound, broadcast, DJ and personal listening. The headphones incorporate technology drawn from Audio Technica’s long history in the field of high performance professional audio, providing exceptional power handling, very high SPL capability, and natural, accurate sound with impactful bass and high frequency extension. With professional-grade earpad and headband material and a collapsible design, the ATH-M50xRD headphones remain comfortable throughout long monitoring sessions and transport easily.